UPDATE 11 July 2014: more Great War postmarks for 28 May have been added to the website today. The Great War prestige stamp book will be issued along with the set of stamps on 28 July 2014. UPDATE: See foot of post for news about the pictorial stamps in the same booklet. The book is printed by Joh Enschede en Zonen and all of the definitive stamps have been printed by Enschede before, so is there nothing new in this list? So let's compare them side by side, with the new stamps on the right in all cases. In the case of the mixed pane, the phosphor bands on the Buckingham Palace pane have a more matt finish when held at an angle to the light, the new ones are less visible. 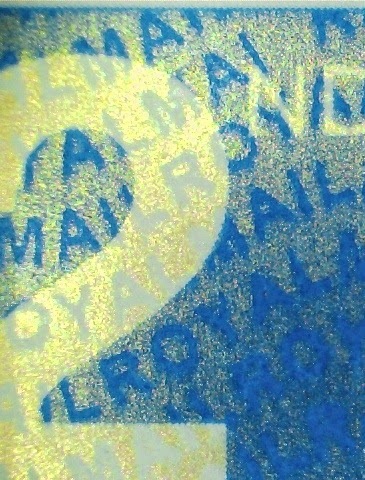 The iridescent layer appears to be easier to read on the new stamps. England 1st - most notably different in shade and density. The silver is different (but is still silver), and the tail of the lion appears to be further from the left edge. The figure of value is lower. Scotland 1st - the new one slightly paler. The apparent dark band at the left must be show through from the selvedge of the Army stamp. The phosphor bands, whilst less visible when held at an angle to the light (the Army one is very matt), is more visible when viewed straight on! Wales 1st - aside from the phosphor differences, there is a very distinct difference in shade here, almost like the sheet printing when the yellow ink was dropped. These are printed in 4-colour process (plus silver) but the difference is very clear. Northern Ireland 1st - again, not a lot of difference here, as you would expect as the 'old' version was only issued in February. Both have the microprinted '©2001' at the foot of the figure '1' but it is very difficult to read as even this uses the four colours. But whereas the other countries' stamps have phosphor bands almost the same width as the British Army ones, this has much narrower phosphor bands than in the Classic Locos book (ie wider visible space between them). £1 wood-brown (RM)/bistre-brown(SG). The new version is lighter and the iridescent layer is easier to read. 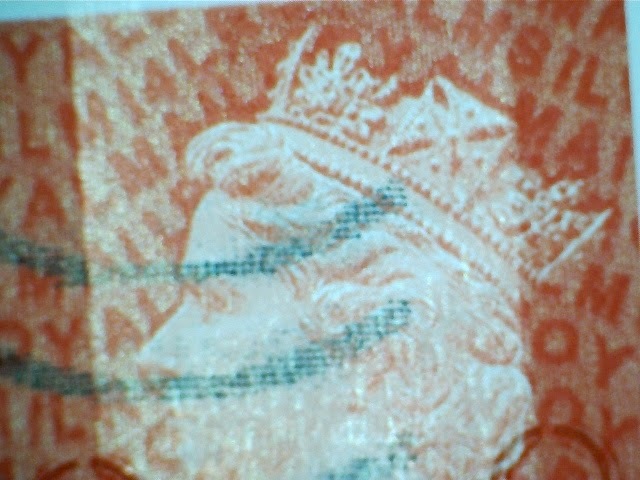 The phosphor on the new stamp is not much different to that on the earlier one. We can now clarify that the King George V 1d red reproductions are not labels, but are all imperforate, and the red is printed on cream to mimic the paper used originally. The rest of the stamps, and the special postmarks for this issue are shown on our webpage. The pictorial stamps issued in sheets have two phosphor bands except for the 'Starburst' painting and 'We Will Remember Them' poetry stamps which are all-over phosphor. We now know that all 6 pictorial stamps in the PSB have all-over phosphor which means that at least 4 will have a separate listing in some catalogues. They are certainly different stamps and we have them in stock now. Let's face it, my website has had its fair share of typos, and other errors. That's what happens when you copy the page for one stamp issue to use again for another one, with all text suitably edited, images changed, etc etc. Yes mistakes occur - and I'm grateful to readers for pointing them out! But when you are responsible for producing stamps, you'd expect that they would be correct. No, mistakes occur there as well, though rarely on British stamps. The Buckingham Palace prestige stamp book did allege that the picture of Sir Winston Churchill on the selvedge of one pane was at Buckingham Palace when he was in fact at the Ministry of Health in Whitehall, but that didn't affect the stamps themselves. After the many errors at Stampex, we were assured that quality control would be improved for future issues. 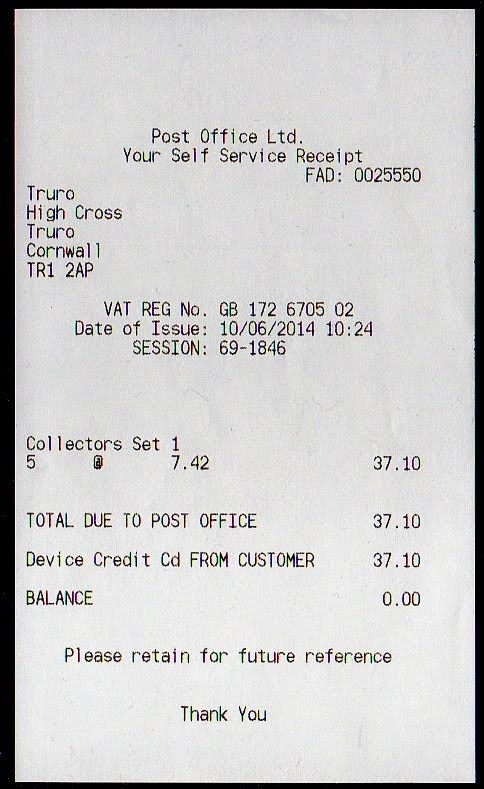 Perhaps that should now be extended to text on the receipts as well as the stamps themselves! Please would everybody who makes a report about something 'seen on eBay' provide the eBay item number and the end date (and if possible the seller ID). This will make it much easier to find the things you are reporting, to investigate, and to grab images to show here. Most collectors will remember the 2009 NAFAS mixed booklet on which one of the letters A was mysteriously dropped from the iridescent text. Then an M was found to be missing from both 1st and 2nd class Large business sheet printings also from 2009. Now we have been told about another missing letter, on this year's 1st and 2nd class Large counter sheets, which have MAI ROYAL near the top, above the 'ST' and 'ND' indicating that the same iridescent cylinder was used for both values. Thanks to Rob for alerting us to this! Unlike the MCIL example - where other booklets had the complete text - these are unlikely to be variants meriting a separate entry in our checklist. It is most likely that the same cylinder will be used for any subsequent 2014 printings - although if you find otherwise, we'd be delighted to be proved wrong! Yes, it's the 1st class MRIL coil with M13L code. 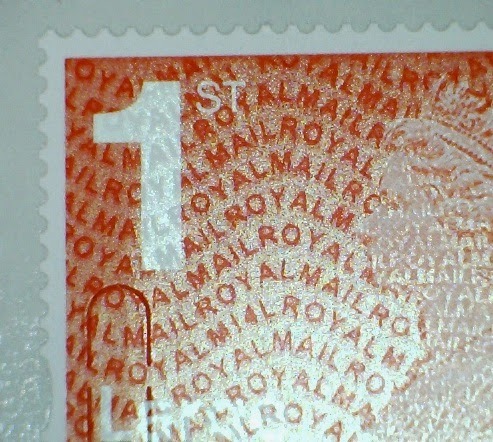 The previous red coil stamp distributed with the palette change issue (3 January 2013) was coded MA12. This new stamp is numbered 2914R.3 in our system. If we get mint stocks, we will let you know! UPDATE 12 JUNE: I'm pleased to say that our letters arrived today (but the extra one is already reserved). UPDATE 18 JUNE: The first of these (to my knowledge) has now appeared on eBay, closed 21 June at £51plus 53p postage - see here. Contrary to received wisdom - 'those who ought to know' had told us that only Machin and Spring Blooms Faststamps were available for NCR Self-Service machines, the MA13 Christmas Robins have made a surprise appearance at Truro. 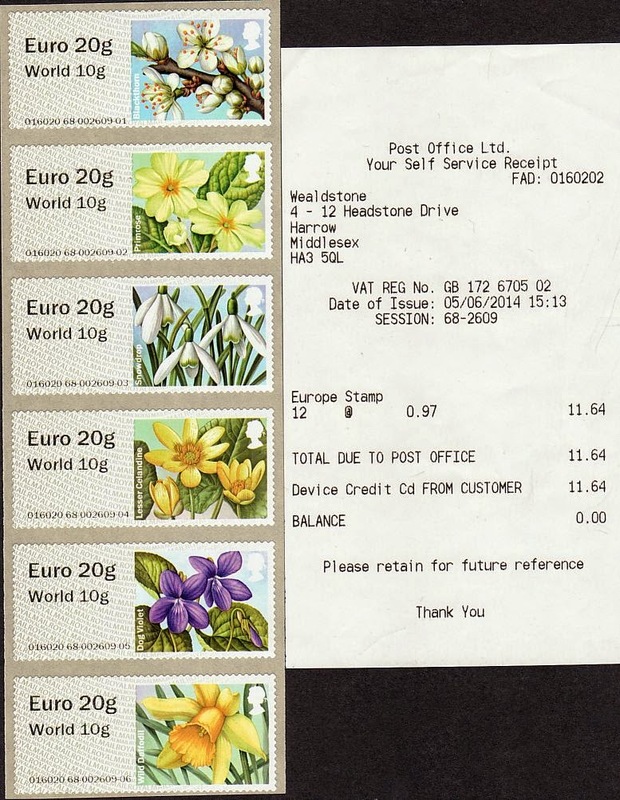 The NCR Post and Go machines were converted on 5 June 2014 so that the 97p stamp showed Euro 20g / World 10g, and the stamps available then are shown here. Earlier posts have outlined the 2014 Post and Go Roadshow programme (see here) We will not be going to York or Korea but I am trying to make arrangements to get a limited supply of material from both shows. We will not be able to get stamps on the opening day, only Saturday, so will only supply mint, not FDC. New compared with Salisbury and Stampex are the E20/W10, E60 and W60 stamps, so those who want a simple collection of one of each will only want these three values to add to their earlier strips. If you would like any of these please email as soon as possible so that orders can be consolidated and arrangements made. 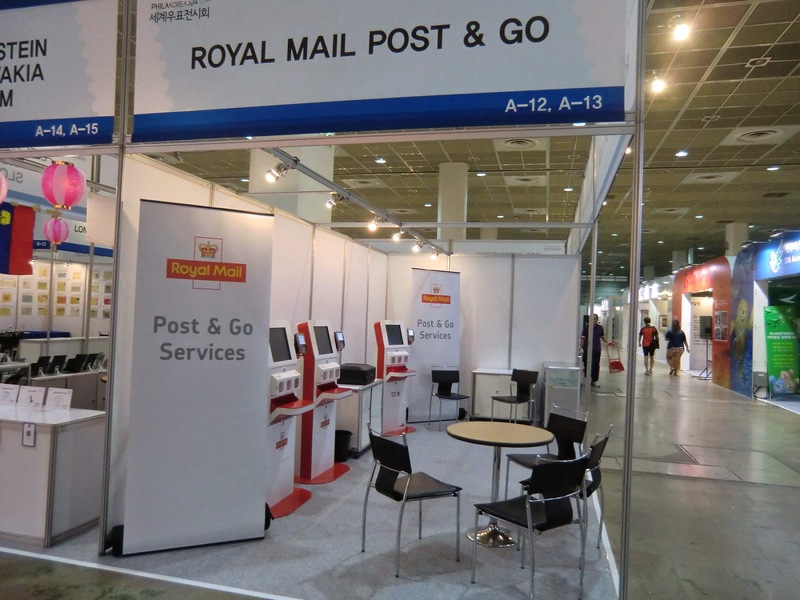 Royal Mail A003 and A004 and Jersey J001 kiosks will be present with the 'Philakorea 2014/World Stamp Expo' caption being on Machin and Union Flag stamps from the Royal Mail machines and on Jersey Flag and Union Flag stamps from J001. These will have KR in the datastring. 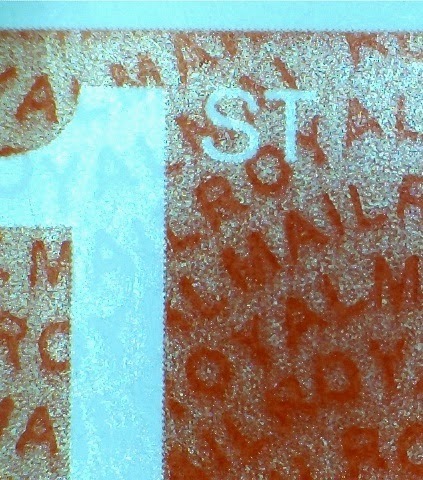 Stamps with GB in the datastring will be available from Royal Mail Tallents House and with JE from Jersey Post's Philatelic Bureau via mail order. 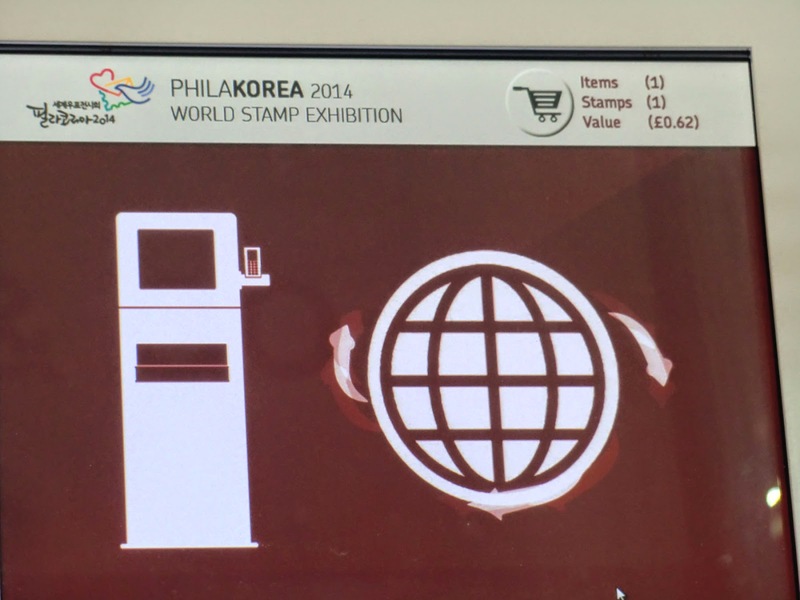 We have tentative arrangements to obtain stamps from the exhibition with KR code but can take no more orders. If you would like mint stamps from Korea please email (see top right) immediately and we will get what we can. Collectors wanting the GB- or JE-coded stamps are advised to apply to the respective bureaux direct. Both the Royal Mail Philatelic Bulletin and the July edition of Stamp Magazine have news that we haven't seen before through the normal channels from Royal Mail. If this were April I would not be surprised at some of the stories and we await with interest whatever detail Royal Mail chooses to share with us. 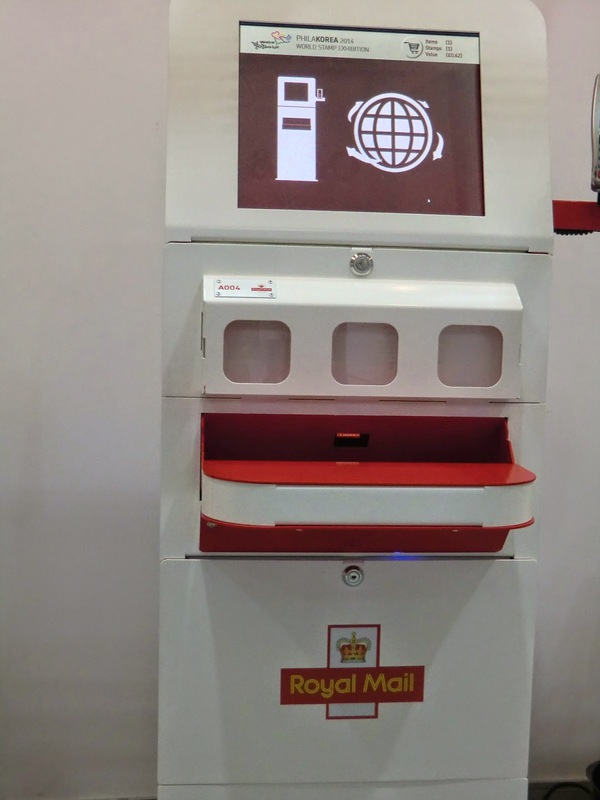 A new pack of Post and Go stamps will be issued through NCR Self-Service terminals in Post Office branches and from Royal Mail Tallents House from 7 July. The pack will contain 5 stamps with a total value of £3.78 (1L, 2L, 1LG, 2LG and A) and will have machine code C002. It seems unlikely that these will be dispensed through NCR terminals. Given the quality of the most recent 1st class red forgery this may only be a minor inconvenience to the forgers. 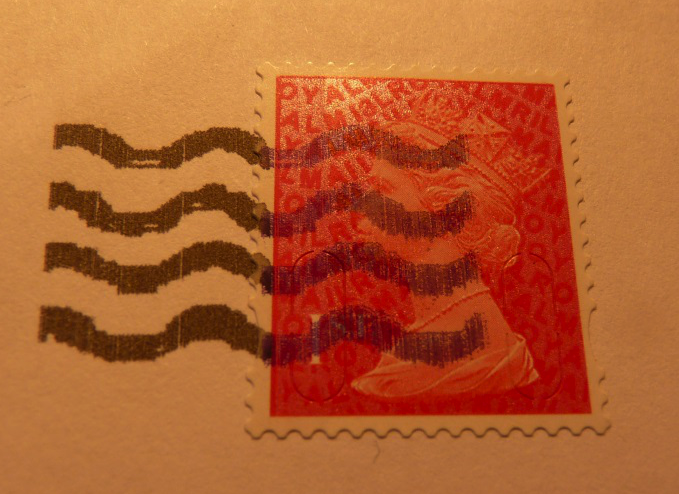 Very few special stamps have been forged (some Christmas stamps seem to have been targeted), so it remains to be seen how the move will affect them. We understand that the colour of the label will remain aproximately the same but that there will be no gold printing. As the gold printing currently repeats the 'ROYALMAIL' text across the labels, it is possible that this will be in white on what will be pale brown labels. Remember Consignia, and how long that lasted? News this week from Post and Parcel that Eesti Post has unveiled its new international name Omniva, which will be used for its logistics solutions and business operations in the Baltic domestic market. The name Eesti Post will be retained for post offices and the mail delivery service, and will be the legal name of the company in Estonia. This summer Eesti Post will gradually introduce the Omniva trademark in Estonia, Latvia and Lithuania, illustrating the international character of the logistics company. Omniva will operate all of the company’s modern communication and logistics services. The internationalisation of the company and enlargement of its domestic market from Estonia to Latvia and Lithuania have driven the need for the new trademark. Chairman of the board Aavo Kärmas said, "The change is also needed because the brand name Eesti Post is strongly associated with postal services, which have been playing an ever-diminishing role in the company’s business over the last decade, and the name is not identified with the nature of contemporary communications and logistics solutions. Eesti Post has become an international logistics company in recent years, which is why a brand name connected only to the postal sector no longer fits with the company’s business strategy for the future." 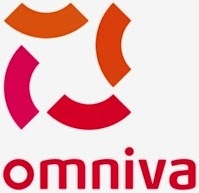 The new name Omniva is derived from the Latin word omni, which means all-inclusive, all in one, everything. In this, the company is expressing its ability to offer customers all-in-one solutions. It is also very similar to the word omnivagus omniva word that means "wandering everywhere." In 2001 Royal Mail was renamed Consignia plc in 2001 and the new name was intended to show that the company did more than deliver mail, however, the change was very unpopular with both the public and employees. 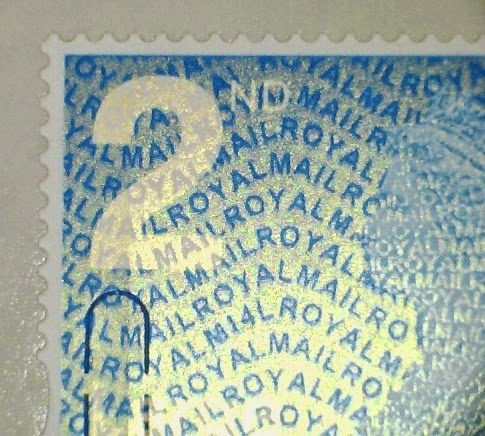 The Communication Workers Union boycotted the name, and the following year, it was announced that the company would be renamed Royal Mail Group plc. Just over a month after Post Office announced that the 97p Faststamp would be changed to show both Europe 20g and Worldwide 10g services, it happened today with no prior announcement - thanks guys! But many thanks to the several people who tweeted, phoned and emailed about this. Thanks to Brian for this picture of part of a collectors strip, this one from Nottingham. Pete confirmed that Cambridge was also updated, but sadly no Spring Blooms left as they only lasted about a week. Maybe there will be some elsewhere so that somebody can produce some first day covers of this new stamp - which may get a sub-number in Stanley Gibbons Concise*. Machins now in stock - no collectors strips yet. Thanks to Chris for the picture of the Spring Blooms from a machine at Wealdstone. Royal Mail will issue a complete set of retail booklets and business sheets on 31 July due to a change in EU rules over telephone after-sales service! From 13 June 2014 it will be against EU law to profit from calls to post-sales lines. Premium rate, revenue-generating numbers can be used for general pre-sales lines as normal. Where a telephone helpline is provided, the basic rate requirement means not charging more than a geographic or mobile rate. This telephone number provided should not provide the trader with a contribution to their costs. Because of this Royal Mail have changed the telephone numbers for their enquiry helpline from 0845 740 740 to 0345 740 740§. * These will appear with 2014 year codes for the first time, producing 4 new stamps with a specific date of issue. We will produce a limited number of first day covers, so if you would like one please contact us in good time. § These may look quite similar, depending on the font used, so extra care will be needed when searching for the new books. The 1st class book of 6 has been printed with M14L code and the old contact details, but we don't know of any findings yet. We don't know whether the expected Commonwealth Games mixed booklet will have new telephone numbers. The booklet of 6 x 1st with the old telephone number has appeared on eBay, and I have an example used from Sheffield on 20 June - any earlier dates would be useful to know! No FDCs for this one. As previously mentioned on an unofficial website (and then removed) we can confirm that a Poppy Faststamp will be available at Autumn Stampex from 17 September 2014. A poppy will be included in the Symbolic Flowers set of six designs to be issued on the same day, but we understand that the Poppy will also be produced on single-design rolls. From what we have seen the design on the Faststamp is very similar to that being issued as one of this year's Great War 1st class stamps to be issued on 28 July. It will be available for Remembrance Day - and at some places is likely to be used in parallel with the Winter Greenery set of 6 due for issue on 13 November. The Post and Parcel website reports that Royal Mail has raised objections to the route of the planned High Speed 2 rail route from London to Birmingham. HS2, as the £43bn project is known, proposes a high-speed rail link between London’s Euston station and the city of Birmingham, with a second phase running up to Manchester and Leeds. Construction is planned to start in 2017, with the first phase open in 2026 and the second in 2032. "The company said three major delivery offices covering a “very substantial” part of London would be subject of compulsory purchase orders, along with the Greenford Mail Centre in the London Borough of Ealing and the Castle Bromwich Delivery Office in Birmingham. "The Greenford Parcel Sort Centre, a leased building, would also be affected by the rail project, and represents a key part of Royal Mail’s operations during the pre-Christmas peak parcel season, handling 15m parcels in November and December. "Royal Mail said that without sufficient mitigation measures, it would not be able to carry out its statutory duty to deliver the mail if the HS2 project goes ahead in current form. "The loss of the Camden Delivery Office to a compulsory purchase order would cause a particular headache, Royal Mail said, because similar sites 'are not generally available' in North London. Talks with the HS2 project managers are ongoing, Royal Mail said, but the mail company has failed to identify an alternative site, and said that it would not vacate its current delivery office unless an alternative site is found, even under a compulsory purchase order." From 'City of Bath' onwards the number of machines was not provided by POL. Some I think we already know about, but others are new and details are awaited.